Make that 52 Fatah al-Islam members killed in fighting. The Lebanese Army killed 36 Fatah al-Islam members in fighting on Friday in the Nahr al-Bared Palestinian refugee camp. Two Lebanese soldiers were martyred. At least 36 militants from Fatah al-Islam were killed in fierce clashes with the Lebanese army in north Lebanon’s Nahr al-Bared Palestinian refugee camp Friday. 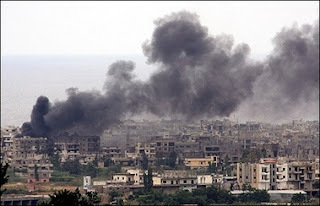 The Lebanese army command, meanwhile, lost “two martyrs,” and demanded that the militants surrender, or be eliminated. “Army units have pursued their field operations around Nahr al-Bared camp in order to control buildings and areas that the gunmen are infiltrating to in order to open sniper fire on military and civilian centers,” it added. The army “succeeded in destroying their bases and controlling them with fire power, while further tightening its grip on them and foiling any attempts to infiltration” out of the camp. “There were many casualties among their (the militants) ranks, and some of them have fled while others have hidden among civilians in order to use them as human shields,” the communiqué added.